In December of 2015, I reported that Broward County Sheriff’s Deputy Peter Peraza was indicted by a grand jury for manslaughter in an officer-involved shooting. 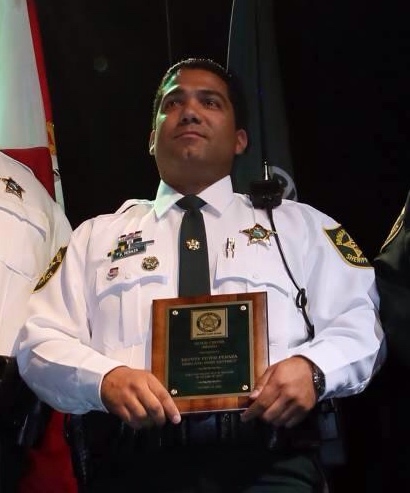 He was the first Florida law enforcement officer charged for an OIS in 25 years. Today, Broward Circuit Judge Michael Usan ruled in favor of Dep. Peraza’s Stand Your Ground motion and dismissed the charge. In July of 2013, Dep. Peraza responded with other deputies to three 911 reports of an armed suspect walking in an apartment complex. The suspect refused to drop his rifle and did not comply with the deputies’ commands. Deputies and a witness stated that the suspect pointed his rifle toward them. The man was shot and killed by Peraza, who fired three bullets. The suspect’s weapon turned out to be an air rifle he had just purchased. He had a history of mental illness. Ear buds in the suspect’s ears may have prevented him from hearing the deputies’ commands. There were conflicting witness statements. The judge took these things into consideration in articulating his decision. Ultimately, he found Peraza’a actions justified. This entry was posted in Legal, Street. Bookmark the permalink. Man carrying a real-looking rifle. Man does not comply with police orders to drop his weapon. Man points real-looking rifle at Deputy. Deputy defends himself. How exactly the hell did charges come out of this? The deputy should never have been charged, but that reality is always a possibility when a Prosecutor is too weak and incompetent to review the facts in light of well-recognized law on self-defense. The officer should never have had to insert “Stand Your Ground”, but should have been able to rely on self-defense alone. A stronger, more competent Prosecutor would not even have taken this to a Grand Jury, but would have exonerated the officer based on established law and the “reasonableness test” that is law throughout the U.S. based on the Supreme Court’s Graham v. Connor ruling. More and more prosecutors (almost entirely an elected position), are foregoing their sworn duty (to uphold the Constitution and the law) and hiding behind a Grand Jury so they can shift blame to the civilians and not take the heat themselves. This sounds like Baltimore, where the Prosecutor deliberately withheld mitigating evidence from the Grand Jury – something the Judge and Trial Juries saw right through and have resulted in every charge being acquitted or dropped. A huge waste of taxpayers’ money, and a devastating ordeal for good cops. We need better mechanisms to remove or otherwise discipline prosecutors who commit unethical acts in office.